I've seen many post on other blog's reviewing Byron Bay Cookies, whilst reading their spectacular post my mouth dribbles, I am a big food lover and I will be the first to admit I have about 10 sweet tooth's! There is just no fun in fruit and veg, OK maybe a banana split but otherwise you cant do any better then a nice sweet treat! So when I checked my emails after a long house keeping week I was glad to be offered a selection of Byron Bay Cookies! Just two days after sending my address to the company, a box arrived on my door step containing 11 beautiful cookies! First impressions are a biggy to me, I've done business at college and everything down to the font has to impress me to have a great first impression, well done Byron Bay Cookies you hit the spot! Byron Bay Cookies originated from Australia. In 2007, wanting to keep with the company’s green credentials and use as many locally sourced ingredients as possible, Byron Bay Cookie Company signed a deal with one of the UK most prestigious bakeries to produce the cookies in the United Kingdom. The postman actually woke me up delivering the cookies, half asleep I dribbled over the selection of beautifully wrapped cookies and decided I needed one for breakfast! It was Saturday morning after all and having been on a diet for the last 3 weeks, I decided I would make this weekend my treat weekend after my brother treated me and Spud to a Chinese on Friday night. Spud and my brother still fast asleep had no idea what they was missing out on, I was sure I was in cookie heaven! 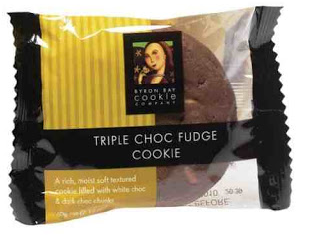 I opened the gluten-free triple choc fudge and bit into it, I'm not just saying this because I am writing this review but I don't think any cookie can relate to this. I don't like shop brought cookies, they are too hard, and too sweet. Byron Bay Cookies are soft and full of flavour, I took my time to eat the cookie and really did taste the flavour and effort that had been put into the cookie. I could taste all 3 chocolates, milk, white and dark, I could taste the fudge pieces, my mouth was in heaven and so were my taste buds. I had to hide the cookies in the cupboard and leave them as I was really determined to taste the White Choc & Macadamia Nuts, my body was screaming at me for turning my back and walking away from the box of 10 remaining cookies, waiting to be tried. I didn't have to wait long as Spud and my brother had one not too long after their breakfast, the diet went out the window, I opened the white choc chunk & macadamia one and was instantly back in food heaven, my brother demolished his choice in not even 2 minutes which was the milk choc chunk and Spud settled for the gluten free chocolate dotty. 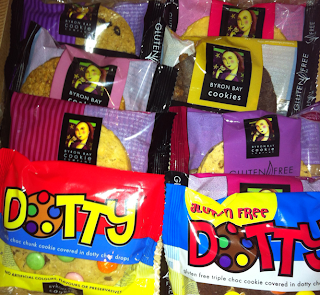 I will describe the Dotty range as cookies with 'smartie' type sweets on top, Spud picked off the treats on top one by one and told me he was saving the best for last, the cookie itself. One more cookie was tried out that day, not by me honestly but my good friend who come over in the afternoon. I couldn't not offer her one of these beautiful cookies could I? After all they needed to be tested and I needed others opinions too. My friend selected the gluten-free strawberries & clotted cream, after about 3 bites she wanted info, where can I buy these she asked? How much do they cost? I need at least 5 a week!! So as you can tell the Byron Bay Cookies are going down really well in our household! I have saved some for my parents as I know they will love the distinguished flavours these cookies offer. As the gluten-free range is gluten-free I was warned that they may be a little dryer and crumblier but that didn't bother me, the taste of the gluten-free range made up because of their beautiful taste. 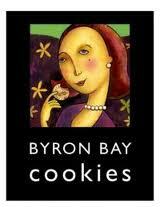 Overall opinions are the Byron Bay Cookies are beautiful, really tasty, full of flavour, thick and truly yummy cookies! The full range of Byron Bay Cookies has been approved by the Vegetarian Society (www.vegsocapproved.com) and their gluten-free range is also registered with Coaliac UK (www.coeliac.org.uk). Byron Bay Cookies have become an international best seller in over 30 countries worldwide, picking up awards for their quality and taste. They now bake over 50 million cookies a year, sell in over 40 countries world-wide and have picked up awards from all over the globe. Larger cookies can be found in all good indepandant cafes, coffee shops and selected health food stores. They also produce a range of gluten-free mini cookie bites (125g boxes) which can be found in larger Sainsbury's in the Free From section. 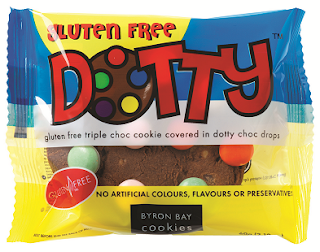 To view the full range and find out more about Bryon Bay Cookies check out the official Byron Bay Cookies website here. 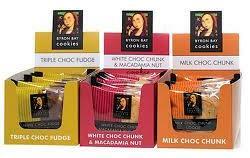 For your chance to win 1 of 2 selection boxes of Byron Bay Cookies enter the competition here. WIN A Baby Jake Prize Bundle! With All This Talk Of Valentines Day.. WIN A Valentines Day Pack From Bazooka Candy!